The hundred kids who had an unforgettable day with Marcos Senna. An unforgettable day, all down to the fact that the city of Vila-real will be Endavant Província's main feature of promotion at the Submarine’s next league match against Real Sociedad (Sunday 6:30pm). 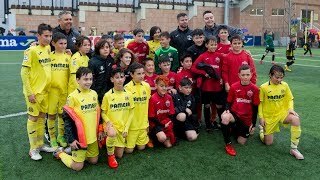 A hundred kids from Vila-real had a unique experience with ex-footballer and current member of the Villarreal CF Institutional Relations department, Marcos Senna, in the traditional football clinic part of the Endavant Província initiative, which was founded a few seasons ago with the objective of promoting tourism in the Castellón province. It was a special day, as the Endavant Província football clinic was the first event to take place at the new municipal ‘Ciutat de l'Esport’ facility, built right next to the Villarreal CF Training Ground (Ciudad Deportiva). The Vila-real Mayor, José Benlloch, and member of the Sports Council, Silvia Gómez, also attended this first event at the new and impressive municipal facilities. 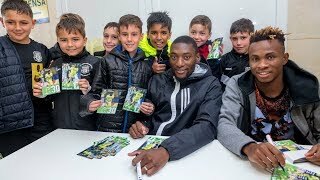 One of the new innovations of the Endavant Província initiative for this season, established two seasons ago with the purpose of promoting tourism in Castellón, is the addition of a clinic for young footballers in the promoted towns by ex-player Marcos Senna and five coaches from the Yellows Academy. To sign up for the clinic with Senna in your town you can find out how to do so at your local Ayuntamiento (Town Hall). Don’t miss out on this opportunity!